The Party Brands Beer Mug Black/Red 2 Pack is a beer lover's dream come true. Our beer "Sippy Cup" has a traditional beer glass shape in a spill resistant double wall mug, so you can sip your beer in style without worrying about spilling. The insulating wall and lid design keeps your beer cooler over a longer period, keeps unwanted dirt and bugs out of your beverage and the colour coded lid is an easy reminder for which glass belongs to you !!! The Party Brands Beer Mug is perfect for the cottage, beach, park, tailgating, or any other casual entertaining event. This 2 Pack contains one Mug with a Black lid and one Mug with a Red lid. Accentuations by Manhattan Comfort Himalayan Salt Shot Glasses brings uniqueness to your party! Made from natural Himalayan salt crystals hand mined in the Himalayan Mountains, the shot glass is naturally anti-bacterial so the product can be reused. Add salt naturally to your shots with the natural carved Himalayan salt shot glass. Diameter measures 2" and includes plastic removable inserts for the shot glass. Weight and color may vary due to the natural variation in the Himalayan Crystal Salt. Includes a set of 4 shot glasses. The Paris is a decorative tabletop fire feature that is designed for both indoor and outdoor use. It creates a beautiful soothing flame. This tabletop will burn for approximately 3 hours with 1 fill of superior quality bio ethanol fuel. Included in the box is one 16oz bottle of superior quality bio ethanol fuel, tempered safety glasses, a snuffer and an easy pour spout. This unit comes with a 3 Year Manufacturers Warranty. The glass can be custom engraved with any design or logo. The Party Brands Wine Tumbler Purple/Green 2 Pack is a wine lover's dream come true. Our wine "Sippy Cup" has a traditional wine glass shape including base in a spill resistant double wall tumbler, so you can sip your wine in style without worrying about spilling. The insulating wall and lid design keeps your wine cooler over a longer period, keeps unwanted dirt and bugs out of your beverage and the colour coded lid is an easy reminder for which glass belongs to you !!! The Party Brands Wine Tumbler is perfect for the cottage, beach, park, tailgating, or any other casual entertaining event. This 2 Pack contains one tumbler with a Purple lid and one tumbler with a Green lid. Beer Mug Black/Red 2 Pack The Party Brands Beer Mug Black/Red 2 Pack is a beer lover's dream come true. 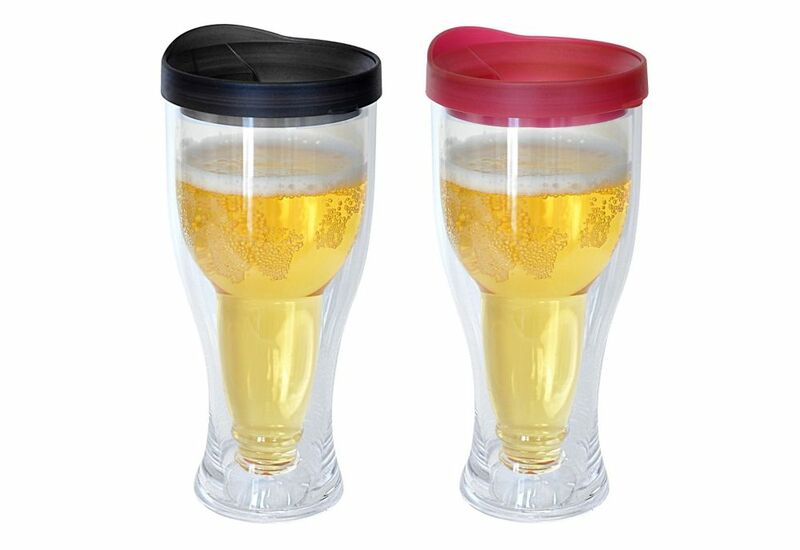 Our beer "Sippy Cup" has a traditional beer glass shape in a spill resistant double wall mug, so you can sip your beer in style without worrying about spilling. The insulating wall and lid design keeps your beer cooler over a longer period, keeps unwanted dirt and bugs out of your beverage and the colour coded lid is an easy reminder for which glass belongs to you !!! The Party Brands Beer Mug is perfect for the cottage, beach, park, tailgating, or any other casual entertaining event. This 2 Pack contains one Mug with a Black lid and one Mug with a Red lid. Beer Mug Black/Red 2 Pack is rated 5.0 out of 5 by 1. Rated 5 out of 5 by Tuesdaysmum from Great father's day present I got these for Father's Day as my parents do a lot of camping. I filled the cups with nuts, and it went over really well! Fun but practical!